We’ll walk you through the 4 easy steps to pick your best dates, given your personal preferences. First we’ll give you some general rules for picking your dates, and below we’ll walk you through the steps. Remember, these rules aren’t made in stone. You can have a great time at Disney any time, but you’ll have to plan really well and adjust your expectations of what you can accomplish. – Summer – Especially June, July and the 1st half of August. It’s intensely hot, humid and rainy, and extremely crowded because American kids are out of school. If you must go in the summer, try to visit as early in June as possible, or as late in August as possible. – Holidays and Holiday weekends – Crowds can soar. Avoid the 4th of July, Easter, Thanksgiving, Christmas, and the days surrounding those dates. – Spring Break – Big crowds! A lot of schools start Spring Break around March 5th, but the majority start from the 12th or 19th of March. So avoid the second week of March through the first few days of April to avoid these crowds. You can still have a great time at Disney World. However you’ll have to re-adjust your expectations so they’re realistic. For one thing, expect to spend a lot more time waiting in lines. You’ll also need to prepare really well in advance so that you can get the most out of your trip. You can create your own park touring plans using a site like touringplans.com to help you minimize the time you’ll wait in lines. 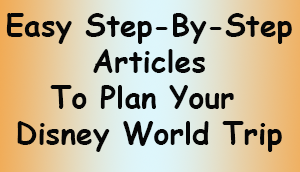 What dates should you pick for your Disney World trip? Most if not all of those events are held annually. If those interest you, you’ll want to take that into account. You’ll see the Festivals and Special Events on the calendars we’ll show you below. You can also look on Disney’s site for Special Event and Festival information here. There are additional events posted on ESPN’s site here. So here are the steps for picking the best dates for you! 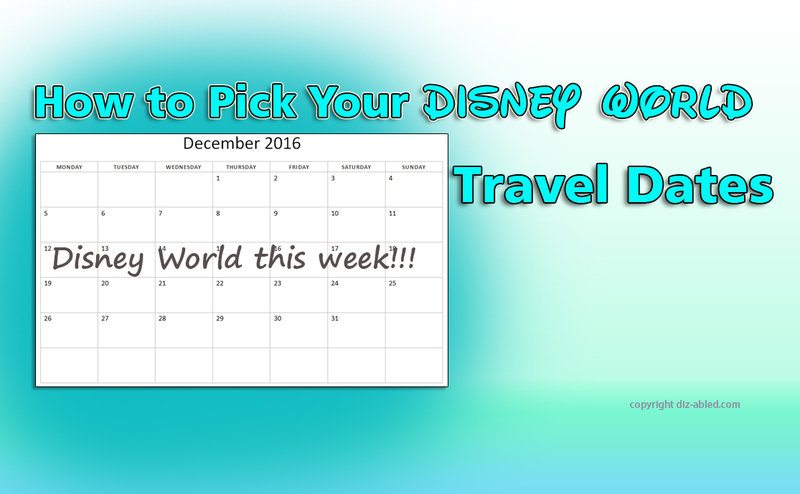 4 steps to follow to pick your dates for your Disney trip! Weather is an important planning factor for many people. Read our article that explains the weather during various seasons at Disney, how it can impact your trip, and which times tend have more comfortable weather. 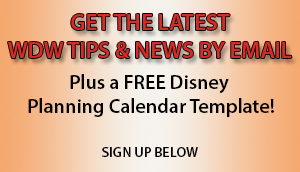 Look at our recommendations and pick your favorite times based on weather to visit Disney. We’ll also be showing you calendars in Step 3 which have the average high and low temperatures, as well as the average rainfall inches. Ticket and resort rates vary at Disney. If you need to visit during lower rate periods to get lower pricing, take a look here at the 2019 Disney World Resort Room Rates & Seasonal Dates page on Mousesavers.com to see how the room rates change by date. Then pick the dates that make sense considering your date preferences from step 1. There are a couple of websites that post crowd Calendars. These will give you an idea of the possible crowd levels throughout the year. Though these are not always 100% accurate, I find that they usually come close and give a reasonable sense of what to expect. So here’s what you do: Using the dates you’ve gotten in steps 1 and 2, we suggest that you find the dates within those time periods that have the lowest projected crowds. If you want to be there for a particular event or festival, factor that in also. 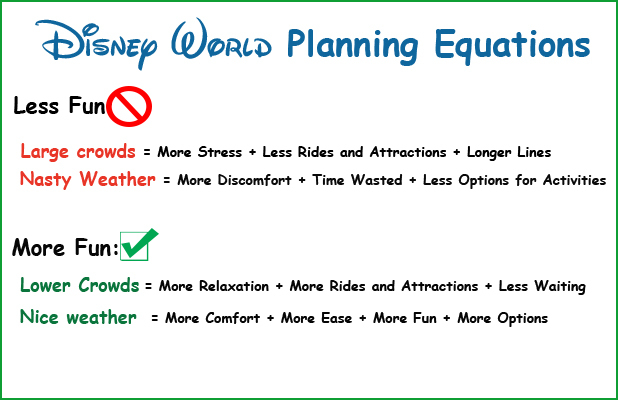 easywdw.com – This is a very popular site for crowd projections. Touringplans.com – This site charges a small fee to join and use their calendar. I like their calendar because it gives you the projected crowd levels for each park, each day. This can help you plan your park days. It’s also very easy to read and understand. wdwprepschool.com – This is a free crowd projection calendar, but it’s not as detailed as touringplans.com version. Dadsguidetowdw.com – Dad has a version that’s very simple to read. kennythepirate.com – Kenny the Pirate is well known for his crowd calendars. I find them a little more complex. Have a couple back-up dates if it’s at all possible for you, in case the resort you’re hoping to stay in isn’t available during your first choice of dates.